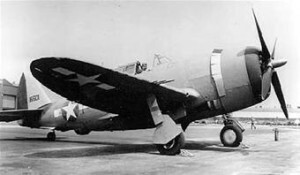 On April 4, 1944, two U.S. Army P-47 fighter planes were conducting “dog fighting” practice over Franklin, Massachusetts, when one aircraft crashed into a wooded area off Maple Street in Franklin. The plane exploded on impact, killing the pilot, 2nd Lt. William J. Bradt, of Buffalo, N.Y. The explosion reportedly left a crater 80 ft. wide and 20 ft. deep in a “boggy” area. Wreckage was scattered for some distance. Witnesses said the plane went into a sharp dive trailing smoke before bursting into flames, and it was speculated that the pilot aimed for the wooded area to avoid nearby buildings. News accounts stated “thousands” came to the scene and engaged in souvenir hunting, prompting police to issue warnings about unexploded .50 caliber bullets. One news reporter found $330 dollars which had been blown from the pilot’s clothing, which he turned over to police.